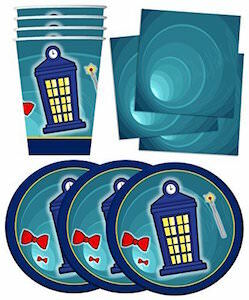 If you are planning a Doctor Who themed party then you need these Tardis paper cups. 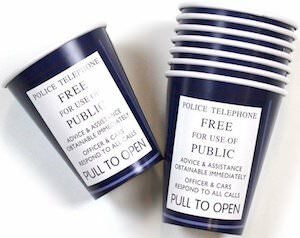 The paper cups are Tardis blue and have the famous door sign on them so that everyone finally can read the whole text that you can find on the door of the Tardis and any classic blue police box. With 8 cups in each pack this set is a good start for any party. Birthday, bbq or more these 9 oz cups are strong and perfect sized for almost any drink. And paper cups don’t have to be washed so after your party clean up will be easy to. 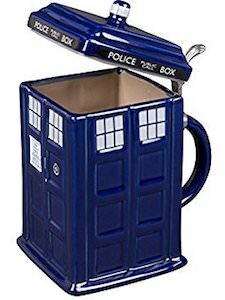 In the winter you take you Doctor Who travel mug with hot drinks but in the summer you need a cup that can hold cold drinks and still be cool. Now there is the acrylic cup that has the Tardis on it and a nice see-through lid with straw so that you can enjoy your ice cold drinks while on the go. This travel cup is perfect for every Doctor Who fan out there and it’s BPA free and can hold up to 16oz of you favorite beverage. If you are gone have a Doctor Who party then of course you need special party wear. 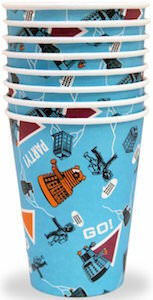 And now there is this set of 8 paper cups that are all in the spirit of Doctor Who. The paper cups are light blue and on that you can find the Tardis and Cybermen and Dalek and the words “Go Party!”. 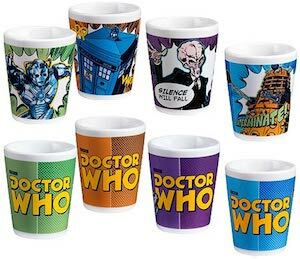 Special paper cups like these just make a Doctor Who birthday party even better and no worries the Dalek and Cybermen will behave because they like cake to. 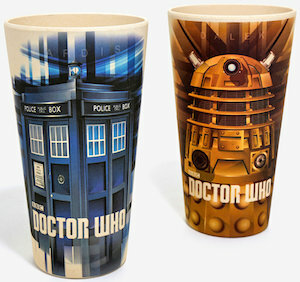 Come and get that party started with these Doctor Who Paper Cups. Looking for a good reason to take a cold drink? 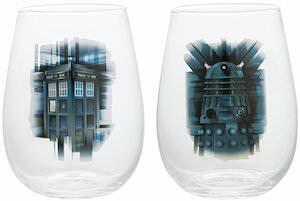 This set of 2 Tardis glasses will give you that reason. The pint size glass shows a pale blue picture of the Tardis on one side and the Doctor Who logo on the other. But when you put a cold drink in it then that all changes to bright colored pictures. A glass of cold water will give you that nice blue Tardis but I can imagine that some other drinks will do that to as long as they are cold. Now you can feel a bit like Doctor Who as you can make the Tardis appear and disappear. 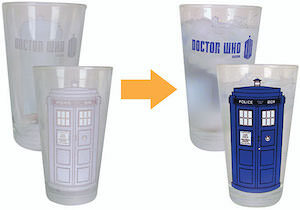 Get rid of those boring pint glasses and replace them with these Doctor Who Disappearing Tardis Pint Glass. Need some small glasses for shots of some other drinks? Doctor Who fans are gone love these little ceramic glasses that come in a pack of 4. The cups are white but are covered with comic style art. Each cup has a different color and on one side you can see the Doctor Who logo and on the other something from the show. You can see the Tardis, Dalek, Cyberman or The Silence on the cups. And yes these Doctor Who glasses are dishwasher safe but they can not be used in the microwave. 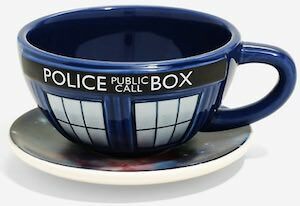 Tea, coffee or something strong it all will fit in this set of Doctor Who Mini Glasses.